Our amazing U13 Camogie Girls beat Craobh Chiaráin in their Div 6 final, and below is a suitably memorable reflection on the game, along with a lovely poem from an anonymous supporter! And couldn’t explain why or which. Of supporters, and fathers and mothers. Encouraged and shouted them on to their win. Thanks to their coaches, it must be allowed. Congratulations, well done girls, Up Scoil! U13 CAMOGIE DIVISION 6 CUP FINAL 2PM, 29/10/2018. In deference to TJ’s appeal for brevity in U13 camogie reportage it is, with some regret, I here resist the urge to inflict upon you, gentle readers, in ómós to our win, sixty stanzas of iambic pentameter in the style of the Bard; one for each epic minute of the proceedings that unfolded upon this bone chillingly wind swept afternoon. However, while it may be the soul of wit, brevity shall not here be the knave that would thieve us of what relish we may glean in vivid reprise of an historic, nay epic, adventure in our club’s onward odyssey. For Scoil, for Oneness, for posterity, bear with this, our say, in its telling of heroic deeds upon the field of play, on what became, it may be claimed, a most momentous Bank holiday. Conceding, as usual, the advantages of average age, average height and average weight we decided, in our wisdom, also to concede the date and venue of this final to our rivals. You may, however, in this historic moment, here allow us one conceit. After Julius, each of our valiant warriors, for such they were, may well proclaim: Veni, vidi, vici! Low scoring, but high octane. In the words of longstanding Scoil stalwart Niamh Crowe … it was definitely the match of the year and the biggest number of supporters I have ever seen at a Scoil game and I have seen a lot. The call went out and Scoil responded, and how. Applying the accuracy of a teller’s tally, JP Courtney estimated the Scoil support at three times that of our hosts. It was like Jack’s army in Giant’s Stadium; the Italian game! To extend this equivalence, Craobh are to our camogie team as were the Azzurri to the Republic circa ’94. To date we’d played four, they’d won four. For context, our last outing against them was the first match of this cup campaign; Craobh 5-1 Scoil 0-2. We travelled more in hope than expectation. Referee, St Monica’s clubman, Philip Cullen threw in the sliotar at the appointed hour. So to battle, for a battle it was. In the truest spirit of officiating the small ball game Philip let the game flow. In the equally honoured spirit of Gaelic games mentoring both side-lines were convinced he was giving them nothing – sign of a well refed game! Breathless as was the game’s first-half, with goalmouth action at both ends, Craobh Chiaráin, on balance, shaded the early exchanges. Fairly breathless too were the supporters, the wind chill was a killer. A killer, we feared, would be conceding early. We did. The concession of our first free from an eminently scorable position, fifteen metres out, straight in front of the posts; Scoil 0-1 down. Follow that! Craobh did, with a blistering strike off the crossbar and back into play. Scoil scrambled it away. Our side-line support caught its collective breath and shivered, not because of the wind chill. The minutes that followed gave cause for pause, how would Scoil respond? Brilliantly! A moment of exquisite skill. A solo run. Stepping a challenge by adroitly flicking the ball over the head of an onrushing defender, catching the ball on the hurl and, without breaking stride, continuing to solo, taking the strike on the run. The strike, from about twenty metres out, dead centre onto goal, was true; one a piece. The battle of will and wit tipped back in Scoil’s favour; a little shock and awe for Craobh Chiaráin to conjure with. Their troubles mounted. These steely Scoilettes, now sensing vulnerability, increased the frequency of their forays towards the Craobh goal. This period of consistent pressure resulted in Scoil being awarded a penalty. Had it been scored, one sensed the potential for unassailable ascendency. Three on the line, seeking to place it low to these goal guardians’ right, the ball shot slightly wide of the upright. A slight swing back in the pendulum of doubt; advantage Craobh. Craobh advanced, Scoil dug in, the half-time whistle came at last. Oranges ready for the kids, sedatives needed by the adults. Honours even for the half, the teams repaired for comfort and counsel to their respective coaches. No Legendary Timmy Ryan monologues (see YouTube). Sustenance and support, calm and composure. We’d never been this close to Craobh at the turn, neck and neck, no second-half mountain to climb this time. It was said, but they already knew, it blazed in their young eyes; we can do this! Carpe diem! Or so we thought, but inauspicious was our resumption. Gifting the dust from throw in, Scoil struggled to settle, Craobh pushing for the win. The paradox of time, the half went by in a flash but was synchronously interminable. Free to Craobh, two points to one. A clash of the ash, a stunned Scoilette standing with half a splintered hurl. Goal mouth drama at their end, cleared, groans and sighs from the swelled ranks of Scoil support. Last ditch defending by the Scoilettes. Cleared over the end line. A 45 for Craobh, ah no! High and handsome, scored with aplomb, Craobh now three one up. That sense of hanging from the cliff as your grip slowly loosens; the abyss awaiting. ‘Ref, how long’, Phil, what’s left?’ No response, the game now broiling, hectic; the ref, absorbed, unhearing. Lightening doesn’t strike twice, or does it? In a reprise of her match winning semi-final goal she struck again. What image fits? Is it the lone warrior on a black charger streaking at the heart of the foe? Is it Braveheart in kilt, braids and face-paint (in Scoil colours) emerging from the mist to the horror and terror of redcoats? Conjure images as you will, afterburners on, ball on stick, charging at the heart of Craobh’s defence. We watched, almost in slow motion, go on, go on, no, no, YEESSSS! Hand-passed to the net. Scoil ascendant. Carpe Diem indeed. ‘Mark up, mark up, it’s not a bloody soccer match’. In their joy and relief, momentarily the Scoilettes forgot themselves, celebrating like Salah. Then back at it, in a phrase, squeaky bum time! That witnessed them upon that October holiday. After a disappointing finish to the Senior year, it’s over to the Junior Hurlers! 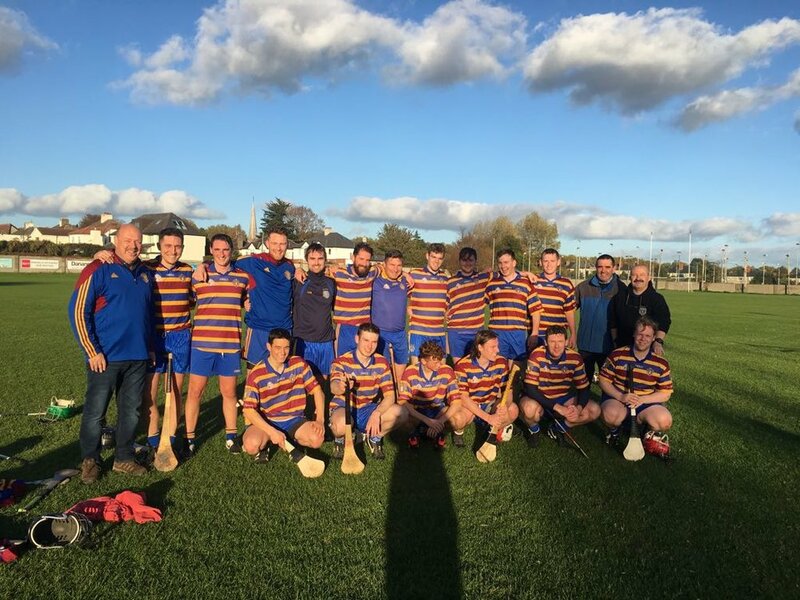 This fantastic team — this week’s Scoil Spotlight feature — have been blazing a trail through AHL9 this year and have justifiably gotten themselves into a position for promotion. Make sure and support the lads after the Minor semi-final in the AHL9 Playoff Final. SINCE ORIGINALLY PUBLISHING, THIS GAME HAS BEEN POSTPONED UNTIL FURTHER NOTICE. MAKE SURE & GET OUT TO SUPPORT THE LADS IN THIS HUGE GAME! Màire will be in the Clubhouse on the next two Saturdays (Nov 3rd & 10th) to collect the shoe boxes. There was a great turaround at the Advanced Camp (Under 11-14) running in the Club this week, with over 40 in attendance. And Head Coach Thomas even taught them some new dance moves! The AHL9 Team aka the "Killer B's"
AHL9 are now competing in their 4th full season and are providing an important role in providing game time to our young adult hurlers in the club with potential of breaking into our AHL2 panel. Both the AHL2 & AHL9 panels meet up to three times a week with great support supplied to the AHL9 group from the AHL2 group. There is a very strong cohort of Hurlers within Scoil and this group has gone from strength to strength following the recent on field successes of the AHL2 team. The main goal of the AHL9 team is to gain promotion and climb up the leagues over the coming seasons. We need to tighten the gap between the two Hurling groups to help maintain our Senior Hurling status. Old age! 😂😂 On a serious note, I'm in a very lucky position to still tog out and with the help of the young Hurling bucks, Scoil stars of the future I've got the opportunity to continue and enjoy some on field success plus improve and strengthening the Hurling group within the club. Please describe any particular characters in the group worthy of a mention. We gave Clontarf a good stuffing this season, always good to let the "Noisy" neighbours know who's boss! We'd played Na Fianna a couple of seasons back. Numbers were extremely tight that day, so Matt Cushion togged out and Tommy Naughton also graced the field in his denim jeans. After two minutes Tommy had pull both hamstrings and Matt had scored a wonder goal! Na Fianna flooded the field with a number of minors and we still won knocking them out of the play off spot. That was a sweet and funny result and will live in legend within the group. We have just secured a play off Final spot so promotion is our next goal. Somebody with a wise head on young shoulders! Our doors are always open and you'll find us in Clontarf Monday and Thursday evenings. We’ll be the ones with the sticks in our hands but don't let that frighten you! Congratulations to the u13s on the first juvenile Camogie final in the Club’s history — full report in article above.